"She Sells Seashells by the Seashore..."
Six participants ages ten and up met two Saturdays in a row to have fun, enhance their drawing abilities, strengthen their observational skills, and improve their perspective, shading and blending techniques using watercolor pencils and watercolor paints. Their muse was... you guessed it! Seashells. The technical term "seashell" usually refers to an exoskeleton of an invertebrate (an animal without a backbone) but is often thought of as the love letter of the sand, a continuing source of inspiration and reminder of the precious ocean. 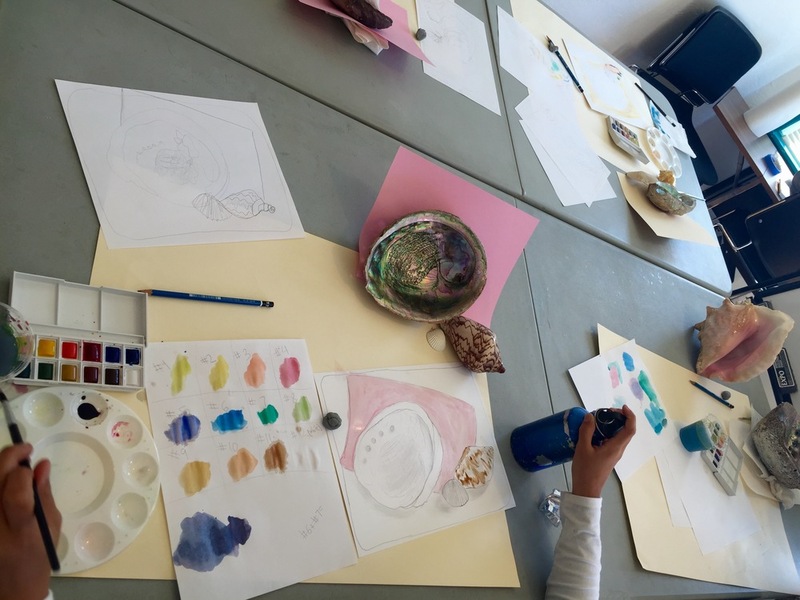 Every seashell has a story, and the students allowed for this exquisite nature to come alive on paper. A fun fact about the instructor Marie Gilmore is that her closet is overflowing with costumes because she was a drawing model for thirty years. She now works at an adult school and as a mentor for at-risk youth in Salinas. Marie collected many of the shells for the class from her backyard. Her guiding voice brought the shells to life; students felt the textured shells, noted their shapes, and got to know their background. Colors ranged from the complicated--the abalone shell--to the simpler--the sand-dollar. The smell of pencils drifted through the room on the first day as the students focused on the shells' outline. The second Saturday, watercolor paints spread upon the Bristol papers. Soft and soothing instrumental music eased the flow of the brush strokes and hues of blue, turquoise and pinks leaped out from the table. Although the shading seemed difficult to conquer, Marie used metaphors to describe the watercolor brush strokes: "Think of carrying a big pan of water and how it wants to splash and move around... use more water and get sloppy with it." Her continuous positive feedback added some calming security to the complexity of the colors. The students' spiraling shading and vibrant artwork evolved beautifully throughout the class; some wished they had another day allocated to this theme. Comments shared after the class were "It was fun and engaging" and "I look very forward to taking more classes in art and gaining a deeper understanding!" We look forward to many more of Marie Gilmore's classes at the Lyceum in the future! Vic Selby has joined the Lyceum for the 2nd time to teach "Games Theory, Classic and Cosmic Puzzles, and the Powers and Limits of Human Imagination". With a degree in physics and engineering, Vic subtly expressed his aversion to a life spent in a laboratory, meticulously calculating each decision. This career path did not seem nearly as rewarding as working with kids. Consequently, he taught math at Carmel High School for 30 years. Vic is the author of Mathematics And the Human Condition and is currently a curriculum consultant. This course is being taught to 8 middle school students and will explore various types of non-video games. With this week being the first of six classes, this blog entry will not fully encapsulate the true essence of this exciting course. In reading the syllabus I am impressed with its extensive framework along with the intimidating feeling similar to reading a foreign language. Exercises included are the "paradox box", "undercut vs. extended tic-tac", "humble-Nishiyama game", "finding the constant", "finding the size of the earth", "speed of light", "distance to the moon", and many many more. Each session ends with the chance to solve some of the best puzzles and conundrums from ancient times to the present, including “The Prisoners' Dilemma”. In addition, students participate in team and individual competitions from the simplest to the most mind-bending. Subsequent classes will include an introduction to the largest and smallest numbers known that describe our universe, and will show how the idea of proportions rules our modern world. Teams will be given the opportunity to create their own games, both games of pure strategy and “real” games involving luck and bluffing. The vision for this class is to be a captivating, fun and innovative experience while exploring some of the most awe-inspiring ideas and discoveries of mathematics and science. In observing the impressive participation from the students on the first day, we foresee highly active engagement among the bright young minds. With all this said, MATH RULES! The 6th Annual Lyceum Middle School Model United Nations Conference will take place Saturday, May 7th at the Middlebury Institute of International Studies (MIIS). Model United Nations (MUN) is a simulation of the “real-life” United Nations. Students act as ambassadors from various countries around the world, and debate topics that are relevant to current global affairs. In order to facilitate the presence of home school students at the event, Julie Frandsen-Horner recruited 8 home schoolers to attend a weekly MUN course. The students, grades 5th through 8th, are welcomed to the Lyceum by Julie, the Lyceum family and the co-facilitators for two hours each Wednesday afternoon. Julie, a speech language pathologist by trade, has been homeschooling her daughter (also a participant) for 10 years. She finds MUN to be a perfect activity for home school students because its a strategic and fun avenue for teaching social studies, geography and the news. Though this year is Julie's first time leading an MUN course, her expertise and vibrant spirit makes her a natural at it. She allocates a minimum of two hours a week for research while the co-facilitators (MIIS graduate students Monique and Stephen) offer their guidance and experience. On the first day, it was clear that Julie and Monique were not the only ones who had devoted previous time to preparing; in hearing the students actively participating it was clear they had done some research as well. The course cycle began with meet & greets, expectations, ice breakers and an introduction to what the United Nations (UN) is. During their first day, most of the students reluctantly mentioned they joined the course because their moms wanted them to (go moms!). However, Julie hopes to witness the students eager to participate the following year from their own free will because of how exciting the conference is. Afterwards, a UN history was presented with an emphasis on peace. By day two, the students fiercely raised their hands with the undeniable wish to be called upon. In addition to reviewing world geography, being assigned countries and debate topics, and obtaining a moderate understanding of the UN, the students are also practicing public speaking. Each student has been assigned a country and one of three UN committees: General Assembly, Security Council, or Economic and Social Council (ECOSOC). While the General Assembly encompasses all countries, the Security Council has five permanent member countries and ten rotating countries, while ECOSOC has a similar smaller list of rotating countries. The students will spend the remainder of the weeks in class focused on their council, country and topic. But MUN doesn't end on May 7th for this inspired and ambitious group. The Wednesday after the conference they will be gathering for one final class to debrief and celebrate. With all this said, we would like to thank Julie for her enormous amount of effort, commitment and enthusiasm. Furthermore the Lyceum would like to thank the MIIS graduate students Monique Rao (studying International Policy and Development), Stephen Doolittle (studying Public Administration), and Brendan Tarnay (studying Migration and Conflict Resolution) for their help, support and assistance in ensuring the success of these classes. We would like to thank the parents for enrolling and supporting their children, and lastly we would like to thank the students for their evolving passion and glorious engagement. All skills were welcome on Saturday, March 19th as scientific illustrator Erin Hunter and 7 students gathered to learn about botanical painting. Learning how to mix colors is an important step in botanical illustration. Erin taught the basics of color theory, with an emphasis on matching colors in leaves, stems and flowers. South African flowers like Proteas, Leucodendrons and Leucospermum were provided as inspirations for the art. She began the class with an hour introduction about the plants themselves. "The more you know about what you're painting, the easier it will be to draw it," she said. The class spent time feeling and visually dissecting the beautiful flowers. Some felt like soft velvet, others furry and bearing an alien-like appearance. One would think these exotic and strange species of flowers were related to the pineapple, artichoke or even a mythical dragon-egg family. Their stems were thick, mighty and sturdy, allowing birds, beetles and rodents to pollinate them. The drawings began with the flower models, pencils and tracing paper, mimicking the flower in life-size. Supplies were readily available and over five types of paper were used, including 100% cotton rag hot press paper for the watercolor designs. The meticulous visual calculations resulted in utilizing the colors most apparent in the flowers, which were mixes of green, red and yellow. As mentioned before, watercolor was applied as the appropriate medium due to its smooth, quick and ample use. The paint is very affected by the weather; luckily it was a beautiful sunny day in Monterey. A technique used that was new to many of the students was wet-on-wet. Here water is applied as a base, followed by the color where water orchestrates the movement and blending of the paint. It is a visually-stimulating and therapeutic brush stroke. Thank you, participants, for attending this class! Everyone was very focused, attentive and lost in their beautiful art. And thank you Erin for being such an informative, talented and wonderful teacher! On their website, National History Day (NHD) describes themselves as a "non-profit education organization in College Park, MD. Established in 1974, NHD offers year-long academic programs that engage over half a million middle-and high-school students around the world annually... in addition to facilitating the discovery of the past, NHD also helps students develop the following attributes that are critical for future success: critical thinking and problem-solving skills, research and reading skills, oral and written communication and presentation skills, self-esteem and confidence, and a sense of responsibility for and involvement in the democratic process." Exploration, Encounter, Exchange in History was this year’s History Day theme presented by the Lyceum of Monterey County and Monterey County Office of Education. On March 12th we celebrated the 26th Annual Monterey County History Day at Los Arboles Middle School. Exhibition set-up began the rainy evening of the 11th, when students and families shipped in rectangular plastic-wrapped exhibits, some as high as 6 feet. They were cautiously displayed in the gymnasium where interviews and the award ceremony would take place the following day. In preparation for the competition on March 12th, students engaged in extensive research of primary sources in order to present papers, posters, exhibits, performances, documentaries and websites based on the theme. Students from multiple schools had the opportunity to present individually or as a group. It was evident on Saturday the amount of meticulous work and calculated ideas invested throughout the process. The proud students worked endlessly for months on researching the impact and change the historical events had (or, in some cases, will have) on society. The hours spent after school and on weekends was done independently from the parent’s guidance. Some families drove as far as 2 hours away to support their children. Volunteer judges began their observations the previous week to review projects in the Website, Documentary, and Paper Categories, and at 8am on March 12th for Exhibit judging. Saturday was devoted to student interviews where they shared their work with volunteer judges from the community. Fascinating topics scattered across the campus included: Gay Rights of 1960-2015, Exploring Gender Equity, Exploring Immigration, The Gun that Wont the West and Dr. Martin Luther King Jr. The students' smiles demonstrated the success of the History Day event; however we were curious to find out more. So, we asked students, "What was your favorite part of the whole process?" Most responded without hesitation. Some mentioned the final result, others the interview itself, and most expressed the satisfaction of accomplishing the deliverable on their own. Congratulations to the winners, finalists, and honorable mentions of this event! County winners (whose names can be found on the History Day section of the Lyceum's website) will proceed to the California state competition. Thank you to our judges who committed themselves to previous training, further research and dedicated time. Thank you to our amazing sponsors: Chapman Foundation, Harden Foundation, Monterey Peninsula Foundation, Monterey Peninsula Volunteer Services, Nancy buck Ransom Foundation, Pebble Beach Foundation, and Yellow Brick Road. Thank you to the History Day Committee, participating teachers, supportive parents & grandparents, and Los Arboles Middle School for graciously hosting the event. Special thanks to the community organizations that donated Special Awards to the event, including: Alliance Francaise, Monterey Bay Aquarium, and the Pac Rep Theater. Most of all, thank you to the students who competed! It is always refreshing to witness the enthusiasm and dedication among the students each year. Imagine a time when smart phones didn’t exist. Hard to envision? Now imagine a time when photography wasn’t as accessible as it is today. Documentation of any kind wasn’t produced by a subtle touch with an index finger. As naturalists and explorers ventured into the unknown world, journals were utilized as a main source of data collection. This was especially instrumental for gardeners and botanists to transfer specimens, drawings and observations during their voyages. Two Saturdays were allocated to honor the magnificent beauty of plants. From dandelions to seaweed, documentation for these organisms was put to practice by enthusiastic students. The instructor of the class, Sharon Nelson, led the first session with an introduction and history behind the Herbarium which dates back to early explorers in the 1800s, in particular Charles Darwin during his exploration of the Beagle in 1831 (See Origin of Species). Herbariums are often thought to be about growing herbs, when in fact it’s a systematically arranged collection and record of preserved plants. This methodology has given many an opportunity to study plants and their environments. One person who had unquenchable curiosity about the natural world was Meriwether Lewis. While Clark kept records of maps and was in charge of the expedition literacy along with the preparation for publication, Lewis did nearly all of the observations, collections and recordings of the plant specimens (See The Definitive Journals of Lewis and Clark - Herbarium). If you aren’t an explorer or botanist but you have an affinity towards plants, this is a therapeutic, creative and beautiful way of keeping a personal record of them. The instructor's interest in Herbarium was due to it being a bridge between art and science, like all botanical art. Five eager students participated in this course, and during the second class, they brought their favorite specimens and used them to make collages and book marks. What are some of the many uses of a herbarium? Keeping track of different medicinal and gastronomic uses of plants and how to prepare the plants for consumption. Documenting different plants that you find in the wild and where you have found them so that you can identify them later. Keeping a record of different places you have been and the beauty you have seen there. Decorating a wall in your home, office, or school. Providing a project-based learning experience for students. Providing a sample for sketches and scientific illustration. Thank you for reading. Hopefully we planted a seed of knowledge to further branch your interests. And for next time, here is some "encourage-mint" so you "leaf" this page with a more than "oak-kay" day. On Saturday, February 27th, over 350 proud family members, supporters and principals filled the gym room at the San Benancio Middle School. The Lyceum celebrated its 32nd Annual Monterey County Spelling Bee for 4th and 5th Graders. Registration began at 9am, although many eager students arrived much earlier. Music such as "I put a spell on you," "Bumblebee," "L-O-V-E," "R-E-S-P-E-C-T" and many other relevant songs played in the background as families took their seats and finalists filled the stage. Nerves, excitement, giant smiles and school banners infused the environment. "Let the Bee begin!" was announced by Lyceum Executive Director Tom Nelson, and the first student stepped carefully towards the microphone. While on the stage, some students were apprehensive, some were fidgety, and some didn't utilize the whiteboard (for precaution). Most of them were confident and all of them exuded bravery while participating with professionalism and ability. Congratulations to the 62 finalists and 62 alternates who made it through to this year's final Spelling Bee competition. The schools represented were: Bay View Academy, Captain Cooper, Carmel River, Castroville, Foothill Elementary, Frank Ledesma, Gabilan Elementary, King Elementary, La Joya, Laurel Wood, Loma Vista, Los Padres, Marina Vista, Mission Park, Monte Vista, Monterey Park, Natividad, Prunedale, Robert Down, Roosevelt, Sacred Heart, San Antonio, San Ardo, San Carlos, Santa Catalina, Sherwood, Spreckels, Stevenson, Tularcitos, University Park and Washington Union. First Place went to Grace Wang of Carmel River School, victoriously spelling words such as carbohydrate, habitual, disguise, immortalize and hesitance. Placing second was Emma Pugh of Tularcitos School in Carmel Valley. Close behind were the third and fourth place finishers, Nikos Douros from Carmel River School and Samuel Low of Mission Park School. We would like to extend a very special Thank You to the students for their dedication and enthusiasm, the teachers, principals, parents and schools for your assistance with the program, our Judges Wayne Cruzan, Bob DeWeese and Christine Westbrook, our word caller, Lisa Ledin, our Hosts Washington Union School District and San Benancio Middle School and our sponsors. Its Friday and 7 eager students, ages 6-8, are ready to jump into "Chinese made easy." The celebration of the Chinese New Year begun on February 8th. Happy year of the Monkey! Yu-Chi (Vickie) joins Lyceum as the native Mandarin teacher. She wore a festive red ensemble, as red is one of the luckiest colors in Chinese culture representing prosperity, loyalty, success and happiness. It was my luck that I unknowingly took notes for this post with a red pen. The kids ability to learn, listen, share and participate was accompanied by a visible enthusiasm throughout. Folders were handed out with colorful assignments that included translations and fun visuals. The students would repeat after Vickie many times to practice their pronunciation. Shortly after they all learned a charming song about greetings and danced along. A fun evening was spent at Lyceum learning Mandarin. Thank You Vickie and Kids, until next Friday. The suspense continued to build after a baseball bat unfortunately became a weapon. The question remained: Is Jamie Hayes a murderer or a hero? What began with the schools Pacific Grove, Alvarez, Palma, Santa Catalina, Salinas, Carmel and Soledad was narrowed to just two finalists at 2pm on Saturday, February 6th: Pacific Grove and Carmel. Real attorneys, judges and teachers came together to coach, guide and instruct high school students, thus leading yet another successful Mock Trial. Professionals were committed to providing experiential learning to these students by finding time after-hours and on weekends to usher in the 18th Mock Trial at the Monterey County Courthouse. Upon entering the court room, it was incredibly challenging to find a seat due to the enthusiastic and supportive audience. Cameras were rolling, parents were eager to witness their kids' courageous performance, and pom poms filled the courtroom. “Aaaallll riiiisee” was voiced by the honorable Judge as he officially inaugurated the show. A thrilling case of "The People vs Hayes," a crime that took place at the fictitious "Central Coast University on May 15th 2014, was about to unravel in a mentally stimulating verdict. The spiral of events that led to a 19-year-old student hitting the campus security guard, which lead to his death, was depicted over the next two hours through professional competency, impeccable performances, and clear communication. The defendant, "freshman Jamie Hayes" sat quietly as witness after witness shared their accusations by pointing out the young man in the blue sweater. The fate of a college student involved in nonviolent rallies against police brutality was in a fearful pendulum, in the hands of the law. “Do you solemnly swear…” was repeated as 8 witnesses were called forward: a security officer, director of campus security, detective and lead investigator, fraud examiner, forensic document examiner, captain of the track team, a friend of Hayes and Hayes himself. The days that led up to the unpredictable verdict had some students dreaming about the case in their sleep; the hard work, constant research and engagement was evident throughout. Adrenaline fired while the trial unfolded. Fingers were crossed, anticipation and hope manifested powerfully as the judge announced the verdict: Hayes was found guilty of manslaughter. The deeply rooted emotion within the students was captivating. The electrifying performance came to a borderline tie breaker between the two high schools. With over 500 points measured in the competition, the award was given to Carmel who won by two points. Certificates were handed out, special thanks were given and the audience was cheering with excited care and support for all of those who participated. It was truly rewarding to witness the students' dedication. Thank you very much to all of those who were involved, and special thanks to Michael Wilden, Peter Funt, Commander Mihu, and the Monterey County Courthouse for making this program the truly special event that it is. We look forward to next year! It was a case of a campus party gone horribly wrong. What started as a night of loud music and camaraderie among members of the track team, quickly ended in the death of a campus security guard. Was this a case of cold-blooded murder by a star student, or was the student acting to defend a third party who had been ruthlessly attacked? It would take seven schools' Mock Trial teams split among three departments in the Monterey County Courthouse to determine the answer. This particular Mock Trial competition consisted of students from Pacific Grove, Alvarez, Palma, Santa Catalina, Salinas, Carmel, and Soledad high schools. In order to qualify for the final Mock Trial competition, the students needed to study this mock case in great depth with the guidance of their teams' coaches. Though the pressure to out-argue their peers was strong among rival schools, the bigger purpose of the Mock Trial activity--to have fun while partaking in a rigorous academic event--was very obvious and present among all the students. For example, in one instance, the defense of one of the schools began heavily questioning the witness at the stand. A passionate member of the prosecution, without a doubt the most vocal among his peers, repeatedly stood up to make objections. Time and time again, each objection was overruled. Suddenly: "Objection on the basis of an ambiguous question!" the boy protested firmly as he stood up with confidence. There was a moment of silence as the judge wearily turned his attention to the boy, mulling over this objection with caution. "Sustained," the judge finally replied before adding, "Even I didn't understand the question." A swell of laughter erupted from both parents and students alike, echoing around the department. Students don't need to be interested in becoming lawyers if they want to participate in Mock Trial. Mock Trial spurs incredible growth and helps students develop practical skills that are applicable to nearly every profession. These skills include, but are not limited to: public speaking and diction, persuasion, critical thinking, analyzing a problem from different angles, understanding both sides of an argument, improvisation and thinking on your feet, teamwork, self-discipline, understanding the U.S. justice system, and courtesy and professionalism. Even students who want to become actors benefit from Mock Trial, since they must take on an identity and remain in character for the duration of the trial without losing their composure. Be sure to return to our blog next Tuesday to find out who wins the final competition and to see photos from the final event! This week, we hear from Claudia's students about their experience in the Lyceum's two-Sunday course on drawing and painting orchids. "It was a fun way to spend the weekend," commented Peter, who received the class as a gift from his wife, Sharon. She and their daughter were also students in this two-weekend workshop. It was clear that the class was a fun way for the family to grow and learn something new together. "I've never done anything like this before," Sharon mused with a smile. "It's amazing what you can learn to do in such a short period of time, and it's super cool to see how different people interpret the same thing in different ways." Toni Kimple declared that her favorite aspect of the class was the camaraderie among the students in the class. Sometimes this camaraderie was very audible, escalating in joyful laughter. Other times, it was tangible in the silence created by each student concentrating on the details of his or her work. "When you're around other like-minded people doing the same thing," she explained, "you may not be talking with any of them, but you're all connected." Claudia Stevens frequently teaches botanical painting at the Lyceum and has her own line of greeting cards. To learn more about her and her work, please click here. The mechanical whirring of a pencil sharpener. The brushing of hands across paper. The creaking and scratching of stumps smudging graphite along spaces too small for fingers to reach. The musical chattering of lively voices discussing light, shadow, color, and the difficulty of transferring a three-dimensional object to only two dimensions. The dry rubbing of knead erasers correcting everything from minute details to the proportions of petals to sepals. That was the soundscape of Claudia Steven's Orchid Painting Workshop at the Lyceum this past Sunday. This was the first class in a two-class series on drawing and painting orchids. After everyone introduced each other, noting that nobody had ever taken a botanical art class before, Claudia led the class into the warm-up portion of the class. "Go ahead and pinch your specimen behind the magnifying glass using the pincers there," Claudia instructed at the beginning of the class. Soft giggles soon erupted as the students fiddled with the device and the angle of the orchids they each received. The class began with loose sketches so that the students could "get to know the plant" and "map it out" on the paper before adding greater detail. "The warm-ups often end up being the best!" Claudia commented. With the help of a light box, the students transferred their sketches to watercolor paper and began carefully selecting and applying color to their drawings. Each painting turned out different, both in color and shape, showcasing the variety of perspective and style present among all the students. Next week, we will hear from the students about their experience in the class. Meet Addy, our newest Lyceum family member! Hey Addy! Welcome to the Lyceum! It's great to have you here. Addy: I am thrilled to be a part of this, so thank you Lyceum Team for welcoming me with such warmth! So, you're a student, right? Addy: Yes, I attend the Middlebury Institute of International Studies, enrolled in the International Policy and Development Master's degree. I'll be graduating in 2017, but regardless of when I will obtain my degree, I always consider myself a student. Sounds like a challenging yet fulfilling degree! So Addy, what are you most excited about as a new coordinator at the Lyceum? Addy: Of course I cannot wait to witness the remarkable talent at Model U.N., Spelling Bee, and other activities, but I am more drawn to the work it will take to build these events--the challenges, work, and teamwork that occur behind the curtains. The entire Lyceum team has achieved wonders, and I look forward to learning and working with such an accomplished, dedicated, and wonderfully orchestrated team. You're too kind, Addy! Hey, I heard you're involved in the Peace Corps. What's that like? Addy: I was a Community Health Volunteer in Peru from 2012 to 2014. Those were the best two years of my life so far, and to describe the love and appreciation of that service would be like trying to describe a sunset--it would cheapen it. But I will give it a try. It was the most challenging yet rewarding job I have ever done. At first, it felt like I had been dropped off in the middle of nowhere and asked to develop, but this "nowhere" named Pedregal, a community of about 5,000, soon became my home, full of warm people and laughing children. I would marvel at my dirty feet and sweaty pit stains that came as a result of hard work and integration: building improved cooking stoves, teaching handwashing where there are no sinks, education about creativity and gender equality, teen pregnancy and HIV/AIDS prevention, and so much more. I will always be thankful for Pedregal's welcome as a part of their community, and will continue to encourage people to join the Peace Corps. I love all colors and lots of it! Because I grew up in Mexico we didn't have clubs, but I was a part of the folklore and ballet dance performances for school representations. Addy: Free drawing and zen tangle. Thank you so much, Addy! It's been a pleasure and we're so happy to have you on our team. What an incredible year 2015 has been for the Lyceum! We feel blessed to say that it's been yet another successful and joyful year of serving Monterey county's youth through our academic and enrichment programs. Our hearts are full of the memories made during this year's events. Check out a few of our favorite moments below! The Lyceum staff would like to thank Program Coordinator Danny Pavitt for a year of incredible work contributing to our mission of inspiring a life-long love of learning. Danny is an International Policy and Development student at the Middlebury Institute of International Studies (MIIS) who joined us in February of this year and will be taking a semester to pursue a MIIS service program. We are excited that he has the opportunity to embark upon an International Professional Service Semester, and we look forward to hearing all about the new adventures that await him in Washington, D.C.
We interviewed Danny to find out more about the Lyceum and how awesome it is to play an influential roles in students' lives. What is your favorite Lyceum event? Danny: All of them! But, if you are making me choose, I think it would be the Middle School Model United Nations event that takes place at MIIS towards the end of the spring semester. I am just endlessly impressed with the level of knowledge the kids come in with. It is clear that they have worked very hard to become well-versed in the topics they study. That, in combination with the formal attire and professional atmosphere, is just an all-around fun and impressive experience for me. What aspect of the Lyceum resonates with you the most? Danny: I love the range of services that the Lyceum provides as a means of "awakening individual creativity". I think curiosity is a feeling/emotion that needs to be praised and encouraged in kids these days, and the multitude of programs that the Lyceum offers enables local youth to engage in things they may not be able to find otherwise. Definitely! So, what's the best thing about working with local youth? Danny: To be able to physically see them learning. I sat in on a couple of conferences for the MUN event, as well as the Expanding Your Horizons conference, and it is pretty easy to see that the kids were learning and experimenting, and that is the whole point of what we do! Also, as we all know, kids have a unique energy that is freeing and boundless, so I always feel mentally rejuvenated after a day at any of our events (but also physically exhausted haha). *Laughter. * I would imagine so! Danny, thinking about how young dreams and interests take many forms, what did you want to be when you were growing up? Danny: I wanted to be a professional soccer player. Maybe I still do, deep down, but I can't tell people that in my old age! It is funny how our personal and professional goals change over time. *Laughter. * You're definitely not old! So, what do you want to be when you grow up now? Danny: Now that I am an "adult", whatever that means, I don't know that I am any closer to knowing what I want to be, although I think I have a better idea of what I DON'T want to be. Instead, I know what I want to be included in my profession setting: The involvement of a second language, daily intercultural exchanges, a socially and environmental aware working space, and compassionate and driven people. That's all! Is that so much to ask? Not at all! It's great that those are the things that inspire you and that motivate you, in the words of Gandhi, to "be the change that you wish to see in the world." Danny, thank you so much for your time! MoCoYoJo is having a busy season! Monterey County Young Journalists (MoCoYoJo) is a program for high school students interested in current events and how the news is covered and reported. The program is certainly having a busy season! With so much happening – from tragic shootings to presidential politics – this year's group has plenty to analyze. MoCoYoJo is organized and funded by the Lyceum and Peter Funt, the locally-based columnist and TV host. "Each year's classes take slightly different paths," Peter explains. "We're guided somewhat by the degree of sophistication that students bring to the sessions, plus the pulse of the news itself. This time we've got a very capable group and a lot of news to chew on." In this week's class, for example, students reviewed coverage of the tragic shootings in San Bernardino. The discussion centered on the media's role – including the decision to enter the suspects' home on live TV. Also discussed was the dramatic front page of New York's Daily News (about which Peter wrote his syndicated column), and The New York Times' editorial about gun control, the first time the paper has run an editorial on page one in nearly 100 years. On December 19, the group will take its annual tour of KSBW-TV, always a highlight for MoCoYoJo. This year's journalists are Zac Buzza, Grace Davis, Ethan Nemiroff, Alexandra Roden and Drew Sharek. Each student is currently reporting and writing a story pegged to activities at their school or in the community, for publication in early January. Read more at the official MoCoYoJo blog here. Expanding Your Horizons is a day-long conference dedicated to young ladies interested in professions related to STEM (Science, Technology, Engineering, and Math) or STEAM fields (with the added "A" representing how art and STEM interact). Over 230 middle school girls participated in the event this year. After kicking off Saturday morning with our keynote speaker Shalina Taylor, PhD, the girls attending various breakout workshops with subjects ranging from "Strawberry CSI" to "Ocean Acidification" to "Turning Pennies into Malachite" and everything in between. Before attending their afternoon breakout workshops, the girls laughed with each other over lunchtime camaraderie and spent time rotating through a career fair. Our career fair participants specialized in themes such as urban planning, veterinary science, robotics, aquaponics, habitat restoration and wildlife preservation, civil engineering, and dentistry, to name just a few. The day ended with a raffle for cool prizes in addition to exchanging contact information with new friends. Is it possible to turn exactly 17 syllables into a story? This is exactly what students practiced in local pet-sitter and author Diane Grindol's 2-class workshop, which called on pets as inspiration for different forms of art. After creating watercolor paintings of their beloved pets from photographs and sharing stories about the quirkiness of each animal's personality, it was time for the students to try to capture that pet's essence in the form of a haiku. "Haiku is a form of Japanese poetry that consists of 3 lines. It's elegant and concise," explains Diane. "There are 5 syllables in the first line, 7 syllables in the second line, and 5 lines again in the third line: 17 syllables all together." One young student, an avid writer, composed two different haikus during the first class. One described her award-winning banty rooster, and the other depicted the family chihuahua that favors her mother above all. Like a true storyteller, she read each haiku out loud to the class in a strong, compelling voice. Diane adds, "Ideally, haiku describes a moment in time, and usually in the natural world. It gets addicting, and I think it's kind of like Sudoku for the literary brain. You have to come up with synonyms." Diane recalls first leaning about haiku in 5th grade at school, alongside another student in the class. However, by no means is haiku limited to a specific time of life, as proven by a 72-year-old student in the class who delighted in sharing stories with the other members about her own life and pets. Diane herself didn't pick up haiku again until later in life, when she started writing haiku poems to read to a writer's group. Eventually, she had so many that she could fill several books with them. However, publishing haikus for Diane was different than other types of writing. "I have been published by major publishers, but the publishing world is changing fast. In order to get my haiku books out into the world, I started looking into self-publishing them. I have been consistently happy with CreateSpace. I sold my books through Borders when it was a local store, and I regularly sell Dogku, Catku, Horseku and RESKU on Amazon over the holidays. The big hit was learning that yes, it's possible to publish a book through a Print On Demand site without putting out lots of money or being required to buy lots of copies. "Though it's in some ways intimidating--putting a book out there feels like baring your soul and your passion to others--it's also a wonderful feeling to be published. I wanted to share the publishing experience with others." Wild laughter echoed throughout the Lyceum this past Thursday afternoon as instructor Janis Steinmann led her students in whimsical free dance to the Sandpaper Ballet, mirroring the famous swirling colors in Van Gogh's Starry Night. After this brief break from painting, the girls returned to their own versions of the famous work, adding finishing streaks of yellow and turquoise across the paper. This class was the second in a three-Thursday course that teaches students about two famous painters, Vincent Van Gogh and Claude Monet. Through storytelling, pictures, and props, Janis weaves engaging background that gives meaning to the paintings that students recreate in this course. This week, during the final Thursday class, Janis and her students will turn their focus to Monet. Want more great artists? Janis Steinmann will be teaching a three-Saturday course for first-graders on Frida Kahlo and Diego Rivera in January 2016. To register your child for the class, please click here. To browse all of our other enrichment classes, please follow this link.